Building a new fireplace surround may sound like a costly, laborious prospect. And that is probably true, IF you're using natural stone materials. These homeowners found a great alternative with FauxPanels -- adding the realistic look of stacked stone, cobblestone and ledgestone without burning up their time or budget. Scott in North Carolina is a do-it-yourselfer who completely gutted his kitchen and living room. High on the remodel's priority list was the outdated red brick fireplace in the living room. Scott wanted to resurface it with the look of stone, but a lack of masonry experience had him look for an alternative. I found your product but was skeptical "can it really look like stone?" I jumped in and purchased your product. Wow! Exceeded all expectation, I have to say it looks better in person than on the website! My 30 year cabinet maker was stunned at the realness and just stood there staring at it, he kept touching it in disbelief! Scott liked the look so much he also added the same style of panels to his kitchen bar to tie it all together. He and his son easily installed them together using our instructions and a few standard tools. Thanks for such an outstanding product that is everything you promised and more! Phyllis and her husband of Red Oak, IA, were building an addition on their home with beautiful pond views. The focal point of the room was to be a large second-story fireplace. Phyllis wanted it to have a stone look, the weight of real stone would have caused major construction complications. Her contractor had never worked with faux panels before, but was impressed with their realistic appearance and ease of application. Everyone that has seen it is amazed that it is not real stone. So happy with the results. The company is amazing to work with and they stand behind their product! I definitely recommend faux panels to anyone who wants to add class to a house inside or out! Our panels are nothing if not versatile -- in this example giving a prefabricated bookcase/shelving unit a more custom look while acting as a surround for the small gas fireplace. We recently received our order, and I was pleasantly and impressed with the quality of your product...the texture and color are perfect, exactly what I expected. Thank you for making a durable and beautiful product that is easy to install and looks fabulous. 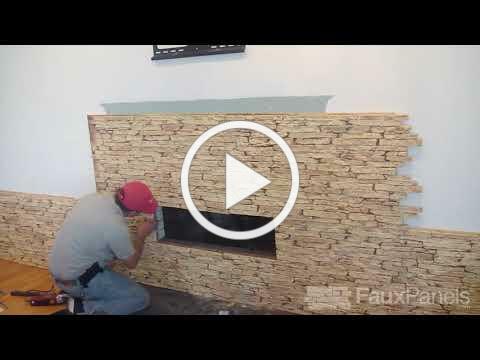 -- Cathy and Mark K.
Like Scott in North Carolina, Larry of Meridian, ID, was renovating his entire living room -- and one that that needed a serious makeover was the red brick fireplace that stuck out like a sore thumb. In this case, Larry added the panels not only around the fireplace but to the entire surrounding wall up to the vaulted ceiling, also swapping out the white mantel with a rustic wooden mantel with corbels. We are very pleased with how nice our project turned out. The FauxPanels samples made it easy to select the perfect style and color for our living room. Ordering was easy and all products arrived on time and in good shape. The instructions were good and installation was easy. The Carlton Cobblestone panels made an amazing transformation of the wall. We could not be happier with the results. Jesse purchased a small cabin in the Great Smoky Mountains of North Carolina, its only heat coming from two small electric baseboard heaters. He knew it would have been too expensive to build a real brick and mortar fireplace -- and it could have compromised the structural integrity of the house. I thought I would give faux panels a try, I am glad I did. Wow!! They were very easy to work with, I finished in two days.We loved them so much that we discussed covering our foundation and below our deck with them also. Everyone that visits raves about how awesome it is and asked who laid the stone work, I smile and say proudly, "me". Thanks Faux Panels for the awesome product!! !